Pupils and teachers from Scotland’s oldest girls’ school are today celebrating another year of impressive achievement following the publication of SQA examination results this morning. Excellent results at Advanced Higher were demonstrated by the pass rate of 96% (A-C grade) and with 90% of grades awarded at A or B grade. The school attained a wonderful 95% pass rate (A-C grade) at Higher level for S5 pupils with 88% achieving A or B grade and pupils in fourth year have equally impressed with a 98% pass rate at National 5, with 90% of candidates achieving at A or B level. St Margaret's School for Girls. 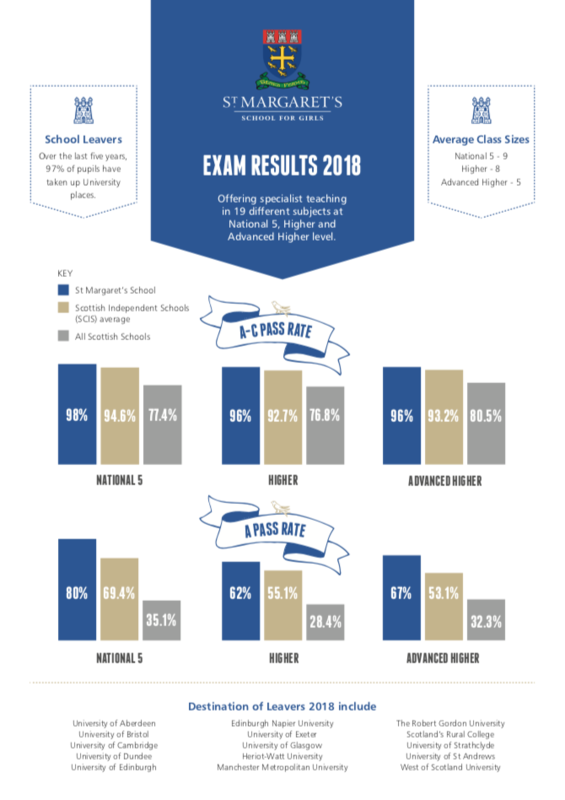 Highest ranking independent school examination results, in Aberdeen 2015 and 2016.